Devin Booker was selected thirteenth by the Phoenix Suns. 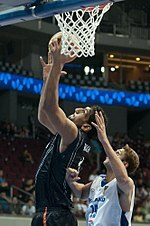 Satnam Singh was selected 52nd by the Dallas Mavericks. Singh became the first Indian to be drafted into the NBA. These players were not selected in the 2015 NBA draft, but have appeared in at least one regular-season or playoff game in the NBA. All drafted players must be at least 19 years old during the calendar year of the draft. In terms of dates, players eligible for the 2015 draft must be born on or before December 31, 1996. Player who are not automatically eligible must declare their eligibility for the draft by notifying the NBA offices in writing no later than 60 days before the draft. For the 2015 draft, this date fell on April 26. After this date, "early entry" players may attend NBA pre-draft camps and individual team workouts to show off their skills and obtain feedback regarding their draft positions. Under the CBA, a player may withdraw his name from consideration from the draft at any time before the final declaration date, which is 10 days before the draft. Under NCAA rules at that time, players only had until April 16 to withdraw from the draft and maintain their college eligibility. In January 2016, the NCAA changed its draft withdrawal date to 10 days after the end of the annual NBA Draft Combine in May, with the 2016 draft the first to be held under the new rule. A player who has hired an agent will forfeit his remaining college eligibility, regardless of whether he is drafted. Also, while the CBA allows a player to withdraw from the draft twice, the NCAA then mandated that a player who declared twice lost his college eligibility. The aforementioned 2016 NCAA rule change also allowed players to declare for more than one draft without losing college eligibility. This year, a total of 48 collegiate players and 43 international players declared as early entry candidates before the April 26 deadline. On June 15, the withdrawal deadline, 34 early entry candidates withdrew from the draft and one early entry candidate is added, leaving 47 collegiate players and 11 international players as the early entry candidates for the draft. They are least 22 years old during the calendar year of the draft. In terms of dates, players born on or before December 31, 1993, are automatically eligible for the 2015 draft. Based on the eligibility rules, every college seniors who have completed their college eligibility and every "international" players who were born on or before December 31, 1993, are automatically eligible for the draft. However, there are other players who became automatically eligible even though they have not completed their four-year college eligibility. The invitation-only NBA Draft Combine was scheduled to occur in Chicago from May 12 to 17. The on-court element of the combine was scheduled for May 14 and 15. The NBA conducted an annual draft lottery to determine the draft order for the teams that did not make the playoffs in the preceding season. Every NBA team that missed the NBA playoffs had a chance at winning a top three pick, but teams with worse records had a better chance at winning a top three pick. After the lottery selected the teams that receive a top three pick, the other teams received an NBA draft pick based on their winning percentage from the prior season. The table below shows each non-playoff team's chances (based on their record at the end of the NBA season) of receiving picks 1–14. The 2015 NBA lottery was held on May 19. The Minnesota Timberwolves, who had the worst record in the NBA and the highest chance to win the lottery at 25%, won the lottery. The Los Angeles Lakers moved from the fourth spot to second, while the Philadelphia 76ers got the third pick. The only team that moved down from their original draft position altogether was the New York Knicks, who moved from the projected second pick to the fourth pick. In the first round of the NBA draft, each team has up to five minutes to decide which player they would like to select. The team can also propose a trade with another team before making their selection. The NBA commissioner will announce the selection and the player, wearing a basketball cap sporting the team's logo, comes up to the stage to be congratulated and presented to the audience. In the second round, each team has up to two minutes to make their picks while the deputy commissioner assumes the commissioner's role. The NBA annually invites around 15–20 players to sit in the "green room", a special room set aside at the draft site for the invited players plus their families and agents. When their names are called, the player leaves the room and goes up on stage. Other players who are not invited are allowed to attend the ceremony, sit in the stands with the fans and walk up on stage when (or if) they are drafted. The 19 players who accepted invitations to attend the draft were Devin Booker, Willie Cauley-Stein, Sam Dekker, Jerian Grant, Rondae Hollis-Jefferson, Stanley Johnson, Frank Kaminsky, Kevon Looney, Trey Lyles, Emmanuel Mudiay, Jahlil Okafor, Kelly Oubre Jr., Cameron Payne, Bobby Portis, Kristaps Porziņģis, D'Angelo Russell, Karl-Anthony Towns, Myles Turner, and Justise Winslow. International prospect Mario Hezonja did not attend because he was still involved with his then-team FC Barcelona at the time. Three other players, R.J. Hunter, Tyus Jones, and Delon Wright all had invitations as well, but they declined their invitations for undisclosed reasons. Washington acquired draft rights to 15th pick Kelly Oubre Jr.
Atlanta acquired Tim Hardaway Jr.
^ a b Nationality indicates the player's national team or representative nationality. If a player has not competed at the international level, then the nationality indicates the national team which the player is eligible to represent according to FIBA rules. 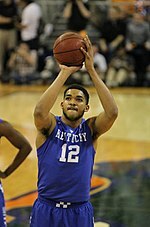 ^ Karl-Anthony Towns was born and raised in the United States to an American father and a Dominican mother. He has represented the Dominican Republic internationally since 2012. ^ Emmanuel Mudiay was born in the Democratic Republic of the Congo, but he was raised in the United States since age 5. He has not represented either country internationally. ^ Cedi Osman was born in Macedonia to a Turkish father and Bosnian mother. He moved to Turkey at age 12 and became a naturalized Turkish citizen. He has represented Turkey internationally since 2014. ^ Zgoda, Jerry (June 26, 2015). "Karl-Anthony Towns taken No.1 by Wolves; Tyus Jones acquired in trade with Cavaliers". Star Tribune. Retrieved June 26, 2015. ^ "Calipari makes Dominican team roster cuts". WKYT. June 16, 2012. Retrieved June 26, 2015. ^ Mannix, Chris (June 24, 2015). "The Long March: Emmanuel Mudiay's journey from Congo to the NBA". Sports Illustrated. Retrieved June 26, 2015. ^ "Brooklyn Nets Acquire All-Star Joe Johnson". NBA.com. July 11, 2012. Retrieved May 6, 2015. ^ Davis, William Scott (March 31, 2015). "A small detail in the 2012 Nets-Hawks blockbuster trade has turned into a huge win for Atlanta". NBA.com. Retrieved May 6, 2015. ^ a b "Hawks Trade For Tim Hardaway Jr". NBA.com. June 25, 2015. Retrieved June 26, 2015. ^ "Rockets Land Ariza & Valuable First Round Pick". NBA.com. July 15, 2014. Retrieved May 6, 2015. ^ "Pelicans Complete Three-Team Trade with Rockets and Wizards". NBA.com. July 15, 2014. Retrieved May 6, 2015. ^ "Knicks Acquire Draft Rights To Jerian Grant". NBA.com. June 25, 2015. Retrieved June 26, 2015. ^ "Nets Acquire Rondae Hollis-Jefferson and Steve Blake". NBA.com. June 26, 2015. Retrieved June 26, 2015. ^ "Timberwolves Acquire Draft Rights to Tyus Jones". NBA.com. June 25, 2015. Retrieved June 25, 2015. ^ "Lakers Acquire Jeremy Lin and Draft Choices in Trade with Rockets". NBA.com. July 13, 2014. Retrieved May 6, 2015. ^ a b Pincus, Eric (April 17, 2015). "Lakers get 27th pick in draft from Rockets after tiebreaker with Clippers". Los Angeles Times. Retrieved May 6, 2015. ^ "Celtics Give Update on Doc Rivers". NBA.com. June 25, 2013. Retrieved May 6, 2015. ^ Givony, Jonathan (June 18, 2015). "Cedi Osman NBA Draft Scouting Report and Video Breakdown". DraftExpress. Retrieved June 26, 2015. ^ "Teen sensation Osman makes Turkey squad". FIBA. August 25, 2014. Retrieved June 26, 2015. ^ "Rockets Make Trades Official". NBA.com. July 11, 2012. Retrieved May 22, 2015. ^ "Heat Aquire Rights to Justin Hamilton". NBA.com. June 29, 2012. Retrieved May 22, 2015. ^ "2012 NBA draft trade roundup". ESPN.com. June 30, 2012. Retrieved May 22, 2015. ^ "Warriors Acquire Jordan Crawford & MarShon Brooks From Boston Celtics". NBA.com. January 15, 2014. Retrieved May 22, 2015. ^ "Celtics Acquire Anthony, Draft Picks". NBA.com. January 15, 2014. Retrieved May 22, 2015. ^ "Sixers Acquire Joel Embiid, Dario Saric in the First Round of the 2014 NBA Draft". NBA.com. June 27, 2014. Retrieved May 22, 2015. ^ "Knicks Acquire Guillermo Hernangomez". NBA.com. June 25, 2015. Retrieved June 25, 2015. ^ "Rockets Acquire Jason Terry and 2nd Round Picks". NBA.com. September 17, 2014. Retrieved May 22, 2015. ^ "Rockets Acquire Veterans Corey Brewer and Alexey Shved in Three-Team Trade with Timberwolves and 76ers". NBA.com. December 19, 2014. Retrieved May 22, 2015. ^ "Nuggets acquire five players, three picks in three-team trade". NBA.com. February 22, 2011. Retrieved May 22, 2015. ^ "Wolves Acquire Anthony Randolph". NBA.com. February 22, 2011. Retrieved May 22, 2015. ^ "Trail Blazers deal Ngombo to Timberwolves". TSN.ca. June 27, 2011. Archived from the original on October 20, 2012. Retrieved May 22, 2015. ^ "Rockets Acquire Papanikolaou, Todorovic and Two Future 2nd Round Picks". NBA.com. July 10, 2013. Retrieved May 22, 2015. ^ "Rockets Acquire K.J. McDaniels and Pablo Prigioni". NBA.com. February 19, 2015. Retrieved May 22, 2015. ^ "Nets Acquire Mehmet Okur". NBA.com. December 22, 2011. Retrieved May 22, 2015. ^ "Jazz Acquires Draft Rights to Raul Neto from Atlanta". NBA.com. June 27, 2013. Retrieved May 22, 2015. ^ "Hawks Trade To Get Lamar Patterson". NBA.com. June 27, 2014. Retrieved May 22, 2015. ^ "Bucks Reach Agreement with Jason Kidd to Become New Head Coach". NBA.com. July 1, 2014. Retrieved May 22, 2015. ^ "Grizzlies acquire Draft Rights to Andrew Harrison from Suns". NBA.com. June 25, 2015. Retrieved June 26, 2015. ^ "Raptors Tab Wright With 20th Pick, Acquire Future First-Round Pick & Rights To Norman Powell From Bucks". NBA.com. June 26, 2015. Retrieved June 26, 2015. ^ "Clippers Acquire Four-time All-Star Chris Paul". NBA.com. December 14, 2011. Retrieved May 22, 2015. ^ "Clippers Acquire Nick Young from Wizards as Part of Three-Team Trade". NBA.com. March 15, 2012. Retrieved May 22, 2015. ^ "Sixers Acquire Two Future Second-Round Picks as Part of Three Team Trade". NBA.com. February 20, 2014. Retrieved May 22, 2015. ^ "Denver Nuggets Acquire Jan Vesely From Washington". NBA.com. February 20, 2014. Retrieved May 22, 2015. ^ "Hawks Acquire 2015 Second Round Pick and Salmons from Toronto". NBA.com. June 30, 2014. Retrieved May 23, 2015. ^ "Orlando Acquires Two Second Round Picks From Chicago". NBA.com. July 14, 2014. Retrieved May 23, 2015. ^ "Cavaliers Select Bennett and Karasev in the First Round of the 2013 NBA Draft". NBA.com. June 27, 2013. Retrieved May 23, 2015. ^ "Bulls Acquire Multiple Draft Picks for Deng". NBA.com. January 7, 2014. Retrieved May 23, 2015. ^ "Nuggets get Gary Harris, Jusuf Nurkic in first round of 2014 NBA Draft". NBA.com. June 26, 2014. Retrieved May 23, 2015. ^ "Cavs Acquire Timofey Mozgov". NBA.com. January 7, 2015. Retrieved May 23, 2015. ^ "Cavaliers Acquire John Lucas III, Malcolm Thomas and Erik Murphy from Utah". NBA.com. July 22, 2014. Retrieved May 23, 2015. ^ "Trail Blazers Acquire Draft Rights to Daniel Diez". NBA.com. June 25, 2015. Retrieved June 26, 2015. ^ "Memphis Grizzlies acquire Jeff Green and Russ Smith in three-team trade with Boston Celtics and New Orleans Pelicans". NBA.com. January 12, 2015. Retrieved May 23, 2015. ^ "Clippers Acquire Rights to Branden Dawson". NBA.com. June 25, 2015. Retrieved June 25, 2015. ^ "Clippers Acquire Cheikh Samb From Denver Nuggets". NBA.com. January 5, 2009. Retrieved May 23, 2015. ^ "Pacers Acquire Amundson from Golden State". NBA.com. December 19, 2011. Retrieved May 23, 2015. ^ "Brandon Rush NBA Stats". Basketball-Reference.com. Retrieved May 23, 2015. ^ "Sixers Trade Evan Turner and Lavoy Allen to Indiana for Danny Granger and Future Second-round Pick". NBA.com. February 20, 2014. Retrieved May 23, 2015. ^ a b c "NBA announces early entry candidates for 2015 Draft". NBA.com. April 28, 2015. Retrieved April 28, 2015. ^ a b c "34 early entry candidates withdraw from 2015 Draft". NBA.com. June 16, 2015. Retrieved June 22, 2015. ^ a b c "NBA Draft-Early Entries". SFGate.com. June 16, 2015. Retrieved June 22, 2015. ^ Cheshire, Jeff (May 29, 2015). "Former Hawaii Rainbow Warriors Forward Isaac Fotu Making NBA Case". The Bleacher Report. Retrieved June 25, 2015. ^ "Jamal Jones To Sign In D-League After Junior Season At Texas A&M". realgm.com. July 31, 2014. ^ a b Kotloff, Brian (June 9, 2015). "The P.J. Hairston Effect? Jamal Jones, Jarvis Threatt Take the NBA D-League Route to NBA Draft". NBA.com. Retrieved June 23, 2015. ^ "Todd Mayo Leaving Marquette To Pursue Pro Career". realgm.com. July 30, 2014. ^ Garner, Kenneth (January 19, 2015). "Todd Mayo looking to achieve NBA dream through the D-league". SB Nation — Big East Coast Bias. Retrieved June 23, 2015. ^ "Source: Emmanuel Mudiay agrees to $1.2 million deal to play in China". yahoo.com. July 22, 2014. ^ Townsend, Brad (June 20, 2015). "Townsend: What will NBA draft hold for Emmanuel Mudiay after skipping SMU for China?". The Dallas Morning News. Retrieved June 23, 2015. ^ "Former Kansas guard Naadir Tharpe headed to D-League". cbssports.com. July 9, 2014. ^ "Report: Dismissed Delaware guard Jarvis Threatt turning pro". nbcsports.com. July 25, 2014. ^ "National Basketball Association Important Dates". NBA.com. January 15, 2015. Archived from the original on December 17, 2013. Retrieved April 28, 2015. ^ "National Basketball Association Important Dates". January 15, 2015. Archived from the original on December 17, 2013. Retrieved April 5, 2015. ^ "Timberwolves win Draft lottery, Lakers move to No. 2". NBA.com. May 19, 2015. Retrieved May 19, 2015. ^ Branson, Scott (June 27, 2014). "NBA draft 2014 reaction: What they're saying around the league". Cleveland.com. Retrieved June 23, 2015. ^ Jackson, Scoop (June 27, 2014). "Parker realizes that just happened". ESPN.com. Retrieved June 23, 2015. ^ "The History of Nets Draft Caps". NBA.com. Retrieved June 23, 2015. ^ Geagan, Matthew (June 27, 2014). "NBA Draft LIVE Blog: No Fireworks For Celtics". CBS Boston. Retrieved June 23, 2015. ^ "NBA draft 2014: Adam Silver shines with selection of Isaiah Austin". The Oregonian. June 27, 2014. Retrieved June 23, 2015. ^ a b Golliver, Ben (June 22, 2015). "NBA announces green room invitees for 2015 NBA draft". Sports Illustrated. Retrieved June 23, 2015. ^ "Jonathan Givony on Twitter". ^ Fitzgerald, Matt (June 22, 2015). "2015 NBA Draft Green-Room Invites: Full List of Players Revealed". The Bleacher Report. Retrieved June 23, 2015. ^ "2015 Draft Trade Tracker". NBA. June 25, 2015. Retrieved June 25, 2015.